I remember the first time I ever heard of Bill Hicks. I was watching one of those countdown shows about the 100 greatest stand-up comedians of all time. As the numbers counted down, I found myself speculating who would be #1. I figured it had to be Richard Pryor. He was #2. I sat there perplexed, wondering who in the world would be considered greater than Pryor. When #1 was revealed to be Bill Hicks, I sat there stunned and asked, "Who?" Unfortunately, I was not the only one who was unaware of Hicks' genius. 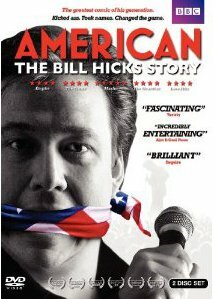 This week the BBC released the documentary American: The Bill Hicks Story. It is a story of the life and career of a comic that many consider to be the best ever. Bill Hicks grew up the youngest child of a close-knit family in Houston, Texas. He was greatly influenced by seeing a performance of Woody Allen doing a stand-up routine on TV and decided to make that his life's work. As a teenager, he began sneaking out of his parents' house at night to perform onstage at a new comedy club in town. The DVD contains clips of some of these touching early performances, which mostly centered around his parents, their strict Southern Baptist views, and life at school. Even though the patrons of the club were much older than he was, he quickly gained a following. Once he graduated from high school, Hicks headed to Los Angeles to try his luck in the entertainment business. He convinced a friend, Dwight Slade, to come with him. Hicks performed at the Comedy Store, where many other comedy greats began their careers, but his main focus during this time was writing a screenplay. He and Slade presented the screenplay to an agent at the prestigious William Morris agency, who told them the ending needed a little work, but that he was interested in seeing more from them. Even though this would be encouraging to most people, for Hicks it was an indication that his career as a screenwriter was a dismal failure. He refused to continue working on the screenplay, and entered into a creative lull. Eventually, he moved back to Texas. He was around age 20 at the time. After returning to Texas, the formerly clean-cut Hicks began to experiment with drugs and alcohol. Although he continued performing, he was often impaired onstage. His contemporaries were amazed at the bitterness and freedom that his lowered inhibitions unleashed -- he said what he felt needed to be said, and no longer worried about what others thought. This continued for several years until he gave up drugs and alcohol altogether and moved to New York. When the newly sober Hicks decided to dive back into comedy, he performed at the Just for Laughs Festival in Montreal. This is when he really began to attract attention. His performance was filmed and shown in the UK, where Hicks became something of an overnight sensation. He performed to great acclaim at the Edinburgh Comedy Festival, and taped a live performance in front of an adoring crowd (which was released as "Revelations"). For the first time, Hicks felt as if an audience "got" what he was trying to say, and his confidence increased exponentially. Unfortunately, when he came back to the U.S., it was to be greeted by the same indifference he had experienced before. Although he appeared on the David Letterman show multiple times, he just could not attract the same following in the U.S. that he had overseas. Still, he was enthusiastic about his career when disaster struck: Hicks was diagnosed with pancreatic cancer. He threw himself into many creative projects: working on screenplays, recording albums, and doing more live performances. He was very proud of his final appearance on the David Letterman show, only to be devastated when his appearance was cut before the program aired (it was finally shown on Jan. 30, 2009). Hicks died on Feb. 26, 1994. He was only 32. The DVD is a wonderful tribute to Hicks. His family and friends provide commentary about his life, and many photos of Hicks are shown in animated sequences that help to illustrate the sometimes frenetic pace which marked Hicks' life. There are actually two DVDs in this set. The first contains the film and extended interviews while the second has more interviews, deleted scenes, rare clips, and Hicks' audio journal entries, among other things. There is also a booklet included about the making of the film. This DVD collection is a wonderful tribute to a comedian who, unfortunately, remains largely unknown in his own country. The great reverence and respect with which other comedians hold him shows that his legacy won't be forgotten any time soon. If you haven't heard of this remarkable man yet, this is a great opportunity for you to learn!